This last weekend - on a lovely Spring day that was all of 46 degrees "warm" ...and raining and hailing (though it would actually SNOW the following day) - we went to the movies. 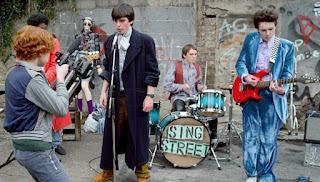 It was 710's pick so he went with Sing Street (such an underdog the studio couldn't / wouldn't complete the website?). We had seen one or two previews - - and honestly, it looked like a mixed bag. I'm never a fan of bullying in all-boys schools, even as a side note. Don't ask me why, but it makes me uncomfortable. Perhaps it was being in an all-boys school and always the anticipation of being bullied or beat-up.....which never actually happened, but the fear was real. Still it looked like a cross between a John Hughes coming of age film and the movie Once. That latter stands to reason, as John Carney, the writer / director of Once helmed writing and directing of Sing Street as well. And even as Carney goes, in my book he was only batting .0500. I was not fond of his second movie - what I deemed a Once redux. Having Adam Levine in that cast isn't helping anyone's case either. 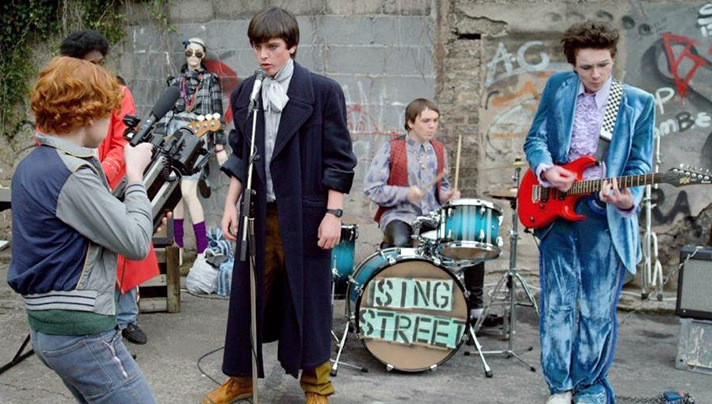 Sing Street was still charming, even though, yes, there were some Once similarities. Carney certainly has a thing for struggling singers / bands wanting to flee Ireland for London in hopes of making it big. I don't know his backstory, but I'd bet $100 he wanted to escape to England when he was a youth. A short premise - though clearly I've told you some of it - set in the mid-80s, a bunch boys at said school start a band. There is home strife, so that adds into it, and molds the band too. But it really the bands of the time - Duran Duran, the Cure, Spandau Ballet, Joe Jackson - that help steer the music portion. I like that the two main members of the band actually play and sing, so that works for me. The guitarist is eerily looking like John Cusack cicra 1984. But the songs are not bad, some of them are quite good. 80s-inspired for sure, but maybe not totally 80s. The final song, as 710 mentioned after we walked out, was the weakest of the bunch. And it was. And it was written and performed by Adam Levine. No shocker - to its inclusion or weakness. For a movie to be about the 80s, it should not include music by a man most likely wasn't born in the 80s. It didn't fit. And it was bad. For a bunch of unknown actors, the group of kids pulls it off fairly well. Though the heart of the film - in my opinion - is the older brother of Conor (the main character). He has the soul of the film, regardless of whatever else is going on. And he has the best lines. I'm 90% sure I was the only person who laughed at this when he was discussing a guy who was dating another woman (as he was listening to Genesis): "no woman can truly love a man who listens to Phil Collins". If you're a stickler for details, you might notice that the timeline of songs don't actually match up to the movie year. But I'm guessing you're not all me. It was - save the anticipation of being beat up at school - a light-hearted 90-100 minutes. Yes, as I'm finding with all Carney movies (all three of them) you kind of have to suspend disbelief, but at least it was easier to do this time than with his last one. I've got this pencilled in as a possible see in three weeks time, though without much enthusiasm. What you say has livened up the prospect just a smidgeon.